Saw this scope on craigslist for $30 and it was not far away so I went to go grab it. It turned on but actually it did not work, so the guy just gave it to me. The trace would cut in and out on certain settings and also float up and down on the screen. Most of the time it was very hard to even get anything to show on the display. 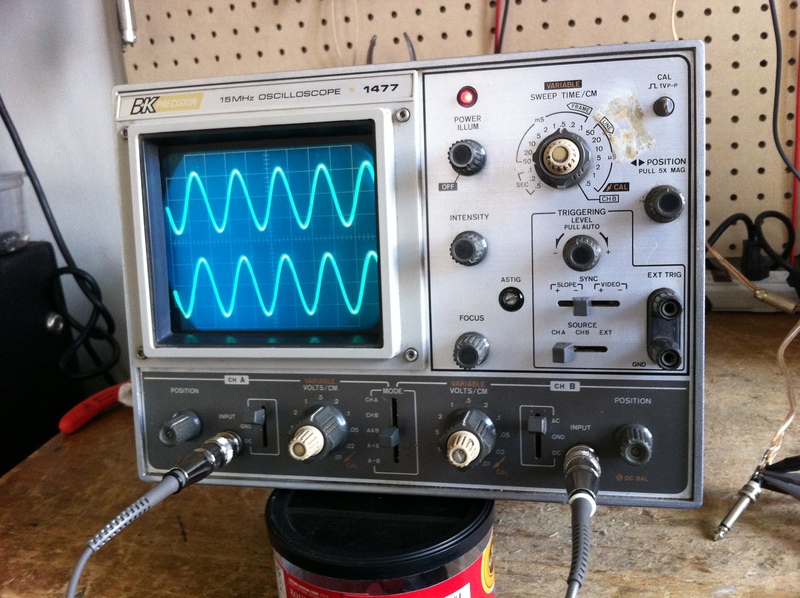 It is a BK Precision 1477 which is a 15Mhz dual-trace scope. 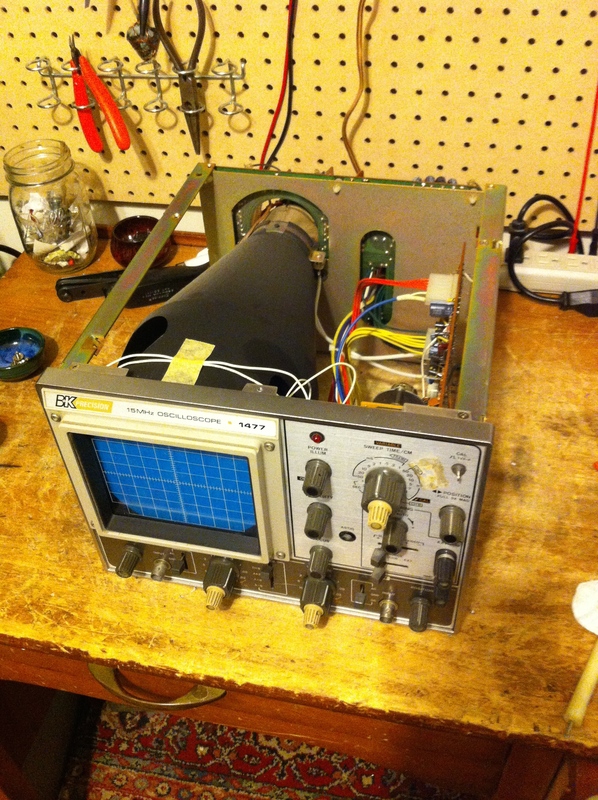 It is an old analog scope probably from the mid 80s and has a CRT screen which is actually just one big tube. CRT means cathode ray tube. With the scope standing upright and the screen facing down you can see big CRT probably takes up half the space in the scope chassis itself. 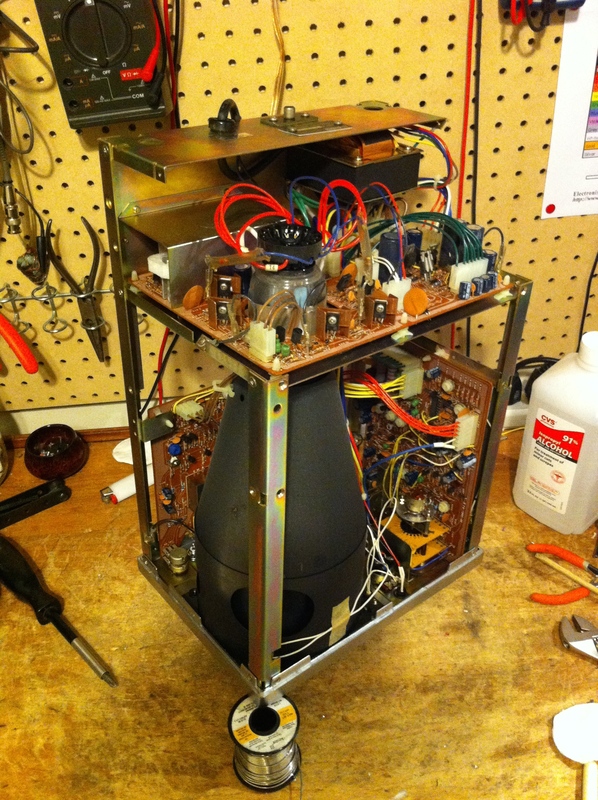 From this side view you can see the power supply on top, the vertical deflection board on the left behind the CRT and the horizontal deflection board on the right. These PCBs connect to the knobs and jacks and switches on the front panel that control your vertical and horizontal scales of the V/t graph. I cleaned all the pots and cleaned and retensioned the BNC input jacks on the front panel. Also re-soldered a bunch of connections where a knob or switch connects to the PCB. These solder connections are always problems in guitar amps because of all the jostling. So mostly just cleaning and touch up stuff for this BK. No parts were replaced. (?) was disconnected on one lead. The screen on this is really nice for what seems like kind of a cheap scope. You can find these on ebay for under $100. 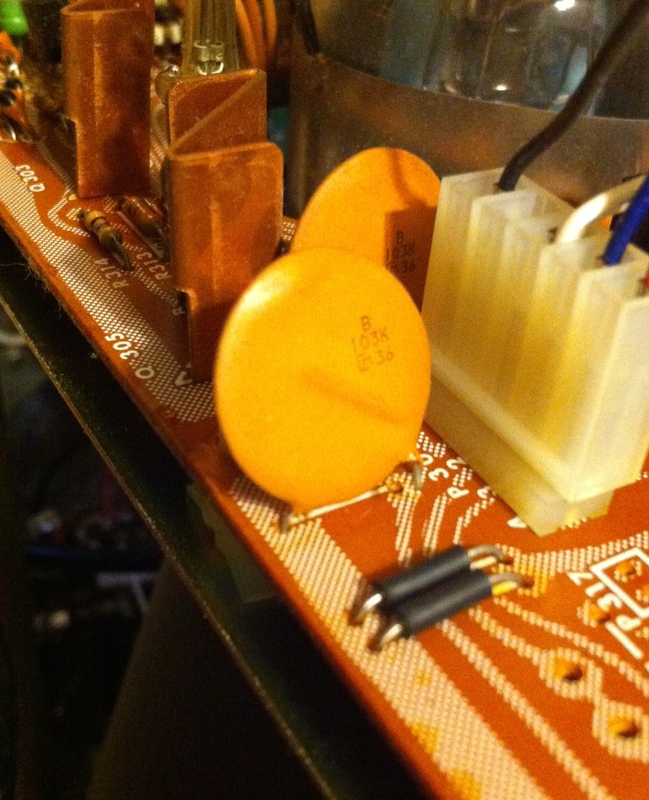 It’s not as bright as my Tektronix CRT scope but the traces are very clear. They don’t move around or cut in and out anymore so the clean up really did it. Digital scopes are very accurate and self calibrating and offer a lot of numerical data on the screen which is valuable, but there is something kind of magical about that old analog trace on the display. Back to the primitive I suppose.